Distraction osteogenesis is a technique that relies on the normal healing process that occurs between controlled, surgically osteotomized bone segments. De novo bone lengthening occurs by gradual, controlled distraction. In contrast to traditional approaches, the soft tissue envelope (the skin, muscle, and neurovascular structures) is simultaneously expanded, which stabilizes the skeletal reconstruction. The technique today is an important part of the reconstructive surgeon's armamentarium. The idea of gradual bone lengthening is not new. The concept originated with orthopedic colleagues solving the problem of leg length discrepancies. In 1905, Codivilla lengthened a femur through serial application of casts that were cut and advanced using bed-frame traction. In 1927, Abbot replaced the casts with large pins placed through fractured femur segments and used springs to lengthen limb. In 1948, Allan incorporated a screw device that more accurately controlled the rate of distraction. However, these early attempts frequently were complicated by infection, ischemic necrosis of skin and muscle, malunion, and delayed ossification with fibrous union. The idea of distraction osteogenesis was largely abandoned by many until the 1950s. Ilizarov minimized complications by performing a corticotomy with minimal disruption of the surrounding blood supply and using a system of tension ring fixators to control the distraction in multiple planes. Through a series of experimental studies and clinical applications, Ilizarov established the foundation of distraction osteogenesis and its role in orthopedic management. Applications in craniofacial surgery were first seen in 1973, when Synder et al applied the approach to mandibular lengthening in a canine animal model. Almost another 20 years passed before McCarthy and colleagues published, in 1992, the first report of mandibular lengthening in 4 children with congenital mandibular deficiency, 3 with hemifacial microsomia, and 1 with Nager syndrome. Thereafter, its role rapidly expanded to the midface and nearly all classic approaches to craniofacial reconstruction. As an underlying principle, Ilizarov proposed the tension-stress model where "slow steady traction of tissues causes them to become metabolically activated, resulting in an increase in the proliferative and biosynthetic functions." The premise is that the newly generated bone between distracted bony ends will result in a stable lengthening and behave as "new" bone, appropriately responding and adapting to the regional environmental loads placed on it. Osteogenesis may be through a cartilaginous or fibrous intermediate. The former, known as endochondral bone formation, is found in the axial skeleton; the latter, intramembranous ossification, is primarily in the craniofacial skeleton. Distraction osteogenesis mimics intramembranous ossification where recruitment and differentiation of primitive cells create a new bony framework. Histologic studies identified 4 stages that result in the eventual formation of mature bone. Stage I, Fibrous tissue precursor: The intervening gap initially is composed of fibrous tissue comprised of longitudinally oriented collagen with spindle-shaped fibroblasts within a mesenchymal matrix of undifferentiated cells. Stage II, Creation of bony scaffold: Slender trabeculae of bone are observed extending from the bony edges. Early bone formation advances along collagen fibers with osteoblasts on the surface of these early bony spicules laying down bone matrix. Histochemically, significantly increased levels of alkaline phosphatase, pyruvic acid, and lactic acid are noted. Stage III, Bony remodeling: Remodeling begins with advancing zones of bone apposition and resorption and an increase in the number of osteoclasts. Stage IV: Structural modification: Compact cortical bone is formed adjacent to the mature bone of the sectioned bone ends, with increasingly less longitudinally oriented bony spicules; this resembles the normal architecture. As the bone undergoes lengthening, each of these stages is observed to overlap from the central zone of primarily fibrous tissue to the zone of increasingly mature bone adjacent to the bony edges. By 8 months, the intervening bone within the distraction zone achieves 90% of the normal bony architecture. Its architecture is believed to be able to withstand normal functional loads. Indications for the use of distraction are broad, and it is applied to solve a wide range of craniofacial deformities. While its use continues to evolve, its appropriateness depends on the particular clinical problem that needs to be addressed. Distraction osteogenesis is an essential procedure in children with craniofacial/hemifacial microsomia. Its indication is based on the severity of the mandibular deficiency. It is ideal in children with Pruzansky class II mandibular deformity if there is sufficient ramus to allow for osteotomy and placement of the distraction device. In Pruzansky class I there is typically sufficient bone to allow for conventional orthognathic surgery. In class III, in which there is insufficient bone for distraction, conventional costochondral rib grafts or vascularized fibula grafts are necessary, followed by distraction osteogenesis when needed. Many children are likely to require staged procedures, with secondary distraction and/or conventional orthognathic surgery, to be able to control the symmetry in multiple planes. In many cases, simultaneous maxillary-mandibular distraction, in which mandibular distraction device drives the maxillary distraction, can be beneficial. 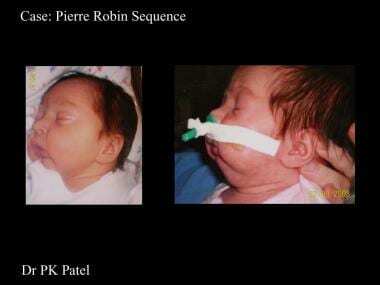 Infant with Pierre Robin sequence. Children with severe midfacial deformities in the context of facial clefts and craniofacial conditions may also benefit from distraction. [5, 7] . It is believed that problems from rebounding forces of the soft tissue envelope and skeletal relapse are less likely to occur with gradual advancement, in contrast to conventional approaches. With the evolution of innovative devices, distraction is applied to an ever-increasing range of reconstructive problems, from deficient alveolar ridges to orbitofrontal advancement. Nevertheless, as with any promising innovation, the benefits and risks of distraction must be weighed carefully. Advantages cited in the literature include minimal likelihood of relapse, increased stability with large movements, simultaneous expansion of soft tissue, decreased operative time, and decreased blood loss and morbidity associated with bone grafts. However, from the placement of the device to its removal, distraction typically requires a period of months; this required length of time needs to be balanced against the procedure’s psychosocial impact on the child or adolescent. Disadvantages of distraction osteogenesis include device failure, cutaneous scars with external pin-based devices, necessity of a secondary procedure for removal of internal devices, limited control of the distracting vector with internal devices, patient compliance and acceptance of the device, and the increased overall treatment time. Additional issues are related to the specifics of the osteotomies, such as neurovascular injury and dental injury. The most significant contraindication to the use of distraction osteogenesis involves the difficulties that patients and their parents may have accepting the distraction device and the treatment process itself. For many children and adolescents, as well as their parents, the significant commitment, compliance, and management required during the distraction procedure may at times be difficult to balance with day-to-day activities. Moreover, children may have significant fear of the procedure, and parents can be hesitant to activate the device. When distraction is performed during the school year, it can significantly impact peer acceptance and the patient’s education. When it is carried out during the summer, the procedure affects summer athletic activities and family vacations. Patients must be thoughtfully selected and fully informed about the treatment process. At our institution, the psychologist is an integral member of the treatment team, and parents and patients are encouraged to meet and talk with families who have had experience with a similar distraction procedure. Ilizarov GA. The Transosseous Osteosynthesis: Theoretical and Clinical Aspects of the Regeneration and Growth of Tissue. New York: Springer-Verlag. 1992. McCarthy JG, Schreiber J, Karp N. Lengthening the human mandible by gradual distraction. Plast Reconstr Surg. 1992 Jan. 89(1):1-8; discussion 9-10. [Medline]. Steinberg B, Fattahi T. Distraction osteogenesis in management of pediatric airway: evidence to support its use. J Oral Maxillofac Surg. 2005 Aug. 63(8):1206-8. [Medline]. Denny AD. Distraction osteogenesis in Pierre Robin neonates with airway obstruction. Clin Plast Surg. 2004 Apr. 31(2):221-9. [Medline]. Hong P, Brake MK, Cavanagh JP, Bezuhly M, Magit AE. Feeding and mandibular distraction osteogenesis in children with Pierre Robin sequence: A case series of functional outcomes. Int J Pediatr Otorhinolaryngol. 2012 Jan 12. [Medline]. Li HY, Lee LA. Sleep-disordered Breathing in Children. Chang Gung Med J. 2009 May-Jun. 32(3):247-57. [Medline]. Kaban LB, Seldin EB, Kikinis R, Yeshwant K, Padwa BL, Troulis MJ. Clinical application of curvilinear distraction osteogenesis for correction of mandibular deformities. J Oral Maxillofac Surg. 2009 May. 67(5):996-1008. [Medline]. Polley JW, Figueroa AA. Management of severe maxillary deficiency in childhood and adolescence through distraction osteogenesis with an external, adjustable, rigid distraction device. J Craniofac Surg. 1997 May. 8(3):181-5; discussion 186. [Medline]. Yamauchi K, Takahashi T, Nogami S, Kataoka Y, Miyamoto I, Funaki K. Horizontal alveolar distraction osteogenesis for dental implant: long-term results. Clin Oral Implants Res. 2012 Jan 26. [Medline]. Chin M, Toth BA. Le Fort III advancement with gradual distraction using internal devices. Plast Reconstr Surg. 1997 Sep. 100(4):819-30; discussion 831-2. [Medline]. Nada RM, Sugar AW, Wijdeveld MG, et al. Current practice of distraction osteogenesis for craniofacial anomalies in Europe: A web based survey. J Craniomaxillofac Surg. 2009 May 15. [Medline]. Verlinden CR, van de Vijfeijken SE, Tuinzing DB, et al. Complications of mandibular distraction osteogenesis for developmental deformities: a systematic review of the literature. Int J Oral Maxillofac Surg. 2015 Jan. 44(1):44-49. [Medline]. Qu M, Hou Y, Xu Y, et al. Precise positioning of an intraoral distractor using augmented reality in patients with hemifacial microsomia. J Craniomaxillofac Surg. 2015 Jan. 43(1):106-12. [Medline]. Cohen SR, Boydston W, Burstein FD. Monobloc distraction osteogenesis during infancy: report of a case and presentation of a new device. Plast Reconstr Surg. 1998 Jun. 101(7):1919-24. [Medline]. Figueroa AA, Polley JW, Friede H, Ko EW. Long-term skeletal stability after maxillary advancement with distraction osteogenesis using a rigid external distraction device in cleft maxillary deformities. Plast Reconstr Surg. 2004 Nov. 114(6):1382-92; discussion 1393-4. [Medline]. Grubb J, Smith T. Practical applications of distraction osteogenesis. Am J Orthod Dentofacial Orthop. 2004 Sep. 126(3):271-2. [Medline]. McCarthy JG. Distraction of the Craniofacial Skeleton. New York: Springer-Verlag; 1999. Menezes RD, Zhao L, Patel PK, Modi V. Volumetric changes in the oropharyngeal airway following bilateral mandibular distraction osteogenesis in Pierre Robin Sequence. J Craniofac Surg. Article submitted July 2008. Mikhail L, Samchukov JB, Cope A. Craniofacial Distraction Osteogenesis. CV Mosby; 2001. Wan DC, Nacamuli RP, Longaker MT. Craniofacial bone tissue engineering. Dent Clin North Am. 2006 Apr. 50(2):175-90, vii. [Medline]. CT imaging illustrating skeletal deformity and airway compromise in infant with Pierre Robin sequence. Presurgical planning to determine the distraction vector and osteotomies. Intraoperative photographs of distractor placement. Typical airway changes after mandibular distraction.